From the moment he was born in January 2010, Lucas Ransom was in a fight for his life. Although he arrived at 33 ½ weeks with a cleft palate that made feeding difficult, he had several other serious problems unrelated to his prematurity that made his condition critical. This included a type of bacterial infection known as Group B strep (GBS), meningitis, sepsis and a build-up of fluid on the brain or hydrocephalus. Initially he spent time in the neonatal intensive care unit at the hospital where he was born. When his condition worsened, his parents, Beth and Brent of North Canton, took him to Akron Children’s Hospital where he was admitted to the pediatric ICU. Soon after this, the Ransoms met the team in Akron Children’s Haslinger Family Pediatric Palliative Care Center. The palliative care team offered moral and emotional support to the Ransoms, especially through the ups and downs of Lucas’ condition. “We almost lost him 3 different times,” said Brent. Along with the emotional rollercoaster of having a critically ill child, the Ransoms also had practical concerns and questions. Lucas still has a VP shunt to relieve fluid and swelling on the brain and a feeding tube, but since May 2013, he no longer has a tracheotomy and is breathing on his own. Although he’s home with his family, which also includes his 8-year-old brother, Aiden, Lucas still requires overnight nursing care through Children’s Home Care Group. Denise helped the family apply for coverage for Lucas’ medical care through Medicaid and Children with Medical Handicaps (BCMH). Palliative care has also assisted the family with other financial concerns, since Beth had to quit her job at a local hospital. Lucas is now 3 and attends an integrated preschool 3 days a week with other children who may have special needs, as well as those who don’t. 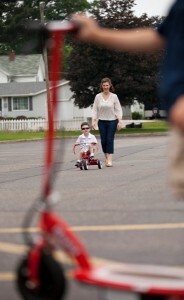 His parents are thrilled that Lucas is able to be with other kids his age and is making friends. “It’s like a dream come true,” said Beth. Because the preschool was not used to having a child who is medically fragile, Denise met with his teachers to review Lucas’ Individualized Education Program (IEP). 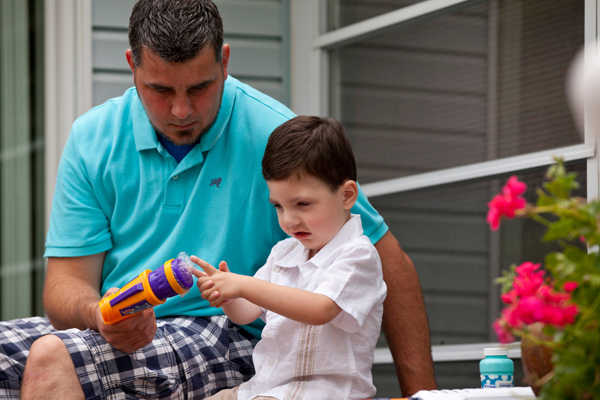 Since starting preschool in January 2013, Lucas has made great strides. He’s starting to say words and has taught his classmates and teachers how to sign, which is his primary method of communicating. 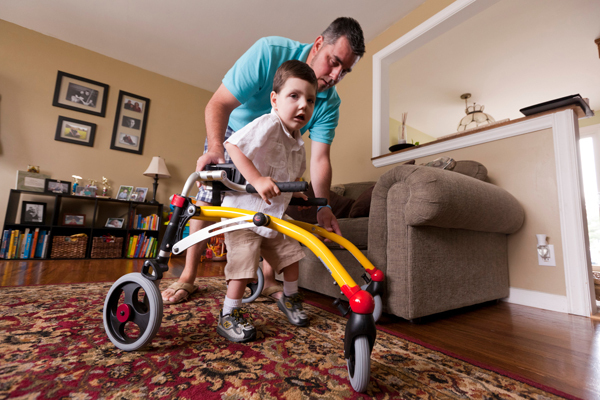 Along with preschool, Lucas attends weekly speech, physical and occupational therapy sessions at Akron Children’s. Previously in a wheelchair, he’s now able to use a walker, often under the watchful eye of Aiden, who’s very protective of his little brother. Through Akron Children’s, the Ransoms have met other families of children with special needs, who all recently attended an event together at the Akron Zoo. “It was so nice to be in a situation where we can all be comfortable and nobody stares or gawks at your child,” said Beth. 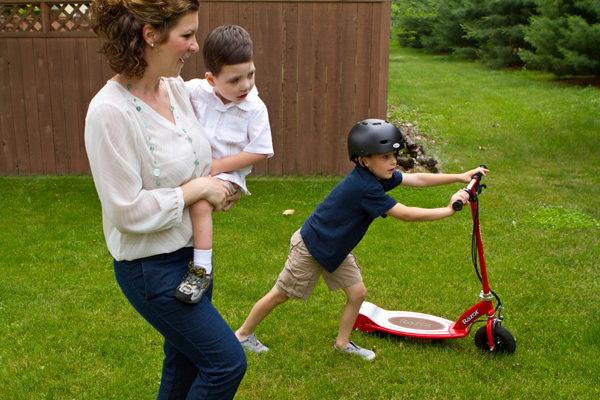 With each new word or skill that Lucas learns, his parents marvel at just how far he has come. “He’s a miracle child,” said Brent.